importantly, low maintenance, as I most definitely do not have a green thumb and love plants that do not require alot of TLC. I currently have a little set of imitation cacti sitting on my kitchen bench which I would really love to to replace with an itsy bitsy terrarium filled with real plants. My family rib me all the time about 'haven't managed to kill those plants yet mummy'. Unfortunately, all my favourite creative terrarium makers are overseas and customs do not allow for the shipping of live plant materials into Australia from other Countries. Alas! So, I went looking for instructions to make my own and found a great little DIY tutorial on Instructables. What a great site. I now have a little glass bowl, not quite as unusual or unique as the one in the tutorial, but pretty cute nonetheless. Now I also need to find the other supplies listed in the project. 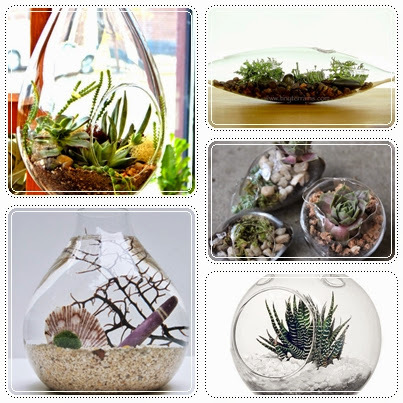 For those who are not feeling creative, or indeed are lucky enough to be free from customs restrictions as you reside in the US I have included some of my favourite ready made terrariums from Etsy below and a link to the stores that sell them. P.S. Hopefully I can post an update showing my finished Terrarium over the next couple of months once I have all the supplies done. 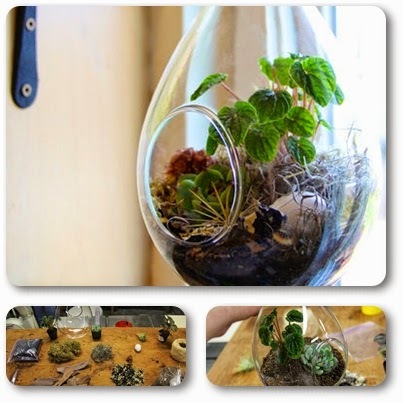 Do you have a terrarium you made, inspire me in my efforts by sharing it in comments so we can see all the possibilities available.